Get your free copy of our master list of keyboard shortcuts for designers. Never fumble for a hotkey in Photoshop, Illustrator, or InDesign again. Cover image composite:background/main image via Africa Studio, poster texture via maodoltee, screen image via OoddySmile Studio. People are always looking for shortcuts that help them work smarter, not harder. Shortcuts are usually discovered through trial and error, but sometimes they’re built right into the process. In the major design applications, keyboard shortcuts for design bridge the gap between effort and action, saving time otherwise spent on the point-and-click-flyout-menu method. Perhaps you know a few keyboard combos to get from point A to point B more efficiently. But do you always remember the right one to use? We think about you – the designer – a lot. That’s why we rounded up some of our favorite, most helpful keyboard shortcuts in this beginner’s list and this more advanced list. You can bookmark these lists, but that won’t do when you’re caught in a pinch, hands hovering over the keyboard, wondering how to quickly select the next tool. 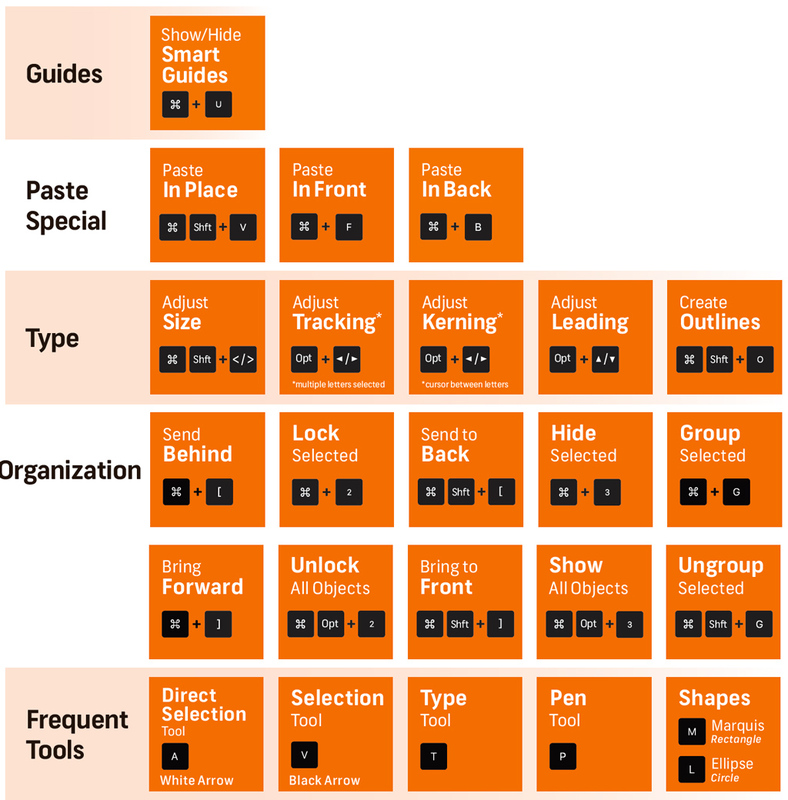 So, to help you even more, we created a handy printable chart for all the most common and useful shortcut key combos* in the big-three Adobe design programs (Photoshop, Illustrator, and InDesign). It’s color-coded, labeled, and grouped for maximum efficiency. We call it the Periodic Table of Adobe Keyboard Shortcuts, and we’re letting you download it here, totally free. Download your FREE PDF copy of the Periodic Table of Adobe Keyboard Shortcuts with the button below. Download it to your mobile device, print it and pin it up, or keep it saved on your desktop for a quick reference guide. (Or print out a huge copy and frame it, as seen above.) It’s a dependable tool to get your work done faster, without surfing through menus or searching online to find the right action. Want to keep things digital? Here’s a master list of every keyboard shortcut for design you’ll find inside. These are shortcuts that work in Photoshop, Illustrator, and InDesign. Think basics like opening, closing, saving, guides, copy, and paste. These Illustrator keyboard shortcuts pertain to actions and tools around vectors and typography, which are Illustrator’s strong suits. You’ll also find keys for grouping and moving things around or locking them. In Photoshop, working with layers is especially important, so there are some keys to move those around. In addition, brushes and tools for making selections are featured. InDesign is special as it handles lots of layout tasks, but it’s also strong in typography, image handling, and vectors. Included here is a broad range of tasks and tools to help you deal with all of these elements. Of course, this is the tip of the iceberg. If you browse the menus of each app, the tools, actions, or menus with shortcut keys attached to them are many. There are some that never get used, and some you’ll use very often, but which aren’t listed here. But with this foundation in keyboard shortcuts, you’ll be able to move on to more complicated key combos specific your work.